On the morning of our 64th walk we decided to depart from routine. 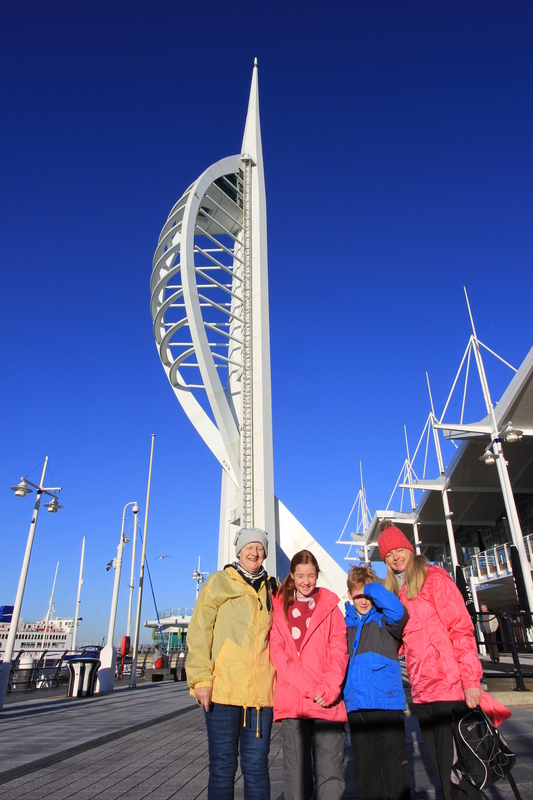 We intended to start at Hayling Island, get the ferry across to Portsmouth and then walk to the Spinnaker Tower. However, we also wanted to visit the Spinnaker Tower for its views, so bought tickets online for a morning slot and decided to go there first. We would then drive back to the start our walk. We could not have asked for better weather! The sun was so bright that nobody could manage to keep their eyes open for a photo! 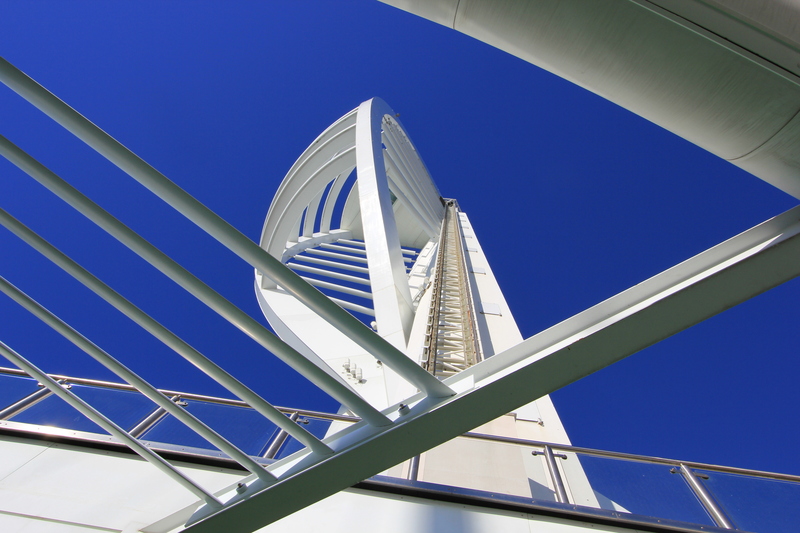 The Spinnaker Tower is a member of the World Federation of Great Towers. There are 40 in total; we had already visited two of them (the Eiffel Tower in Paris and the Fernsehturm in Berlin). We were today going to add one more to that total. To become a member of the World Federation of Great Towers a tower has to satisfy four criteria. The first, quite obviously, is that it must be a tower. In addition it must be a notable tourist attraction; it must have an observation deck open to the public; and it must have unique attributes, such as height, historic significance or unique features. Its sleek lines demand awe from just about every angle. The design is based on a spinnaker, a three-cornered light sail which is usually set forward of the mast of a yacht. On this morning, with its brilliant white curves against an equally brilliant blue sky, the Spinnaker Tower was a truly beautiful building. We were impressed. And we hadn’t even been up to the viewing platform yet! This entry was posted in Hampshire, Islands and tagged architecture, coast, photography, Portsmouth, Spinnaker Tower, tower, travel, walking, World Federation of Great Towers. Bookmark the permalink. I never knew about the list of towers – I’ve been to four of them! We are going to try to get round a few more of them but a fair few are spread around China and the rest of the world so it will take a while to bag all 40! list that I would ever have a chance of visiting Lol!